Hello and Happy Thursday! Because I enjoyed eating fruit mashups, I recently decided to try another product by Revolution Foods called PopAlongs. When I bought them (at Whole Foods), I was a bit suspicious that they would be akin to other similar looking popped chips on the market which I found to be somewhat underwhelming, but they are actually *so* much better and nothing like the other popped chips at all. The flavor of PopAlongs I purchased is called "Simply Cinnamon," and the chips are made from whole grains rather than rice or potatoes. 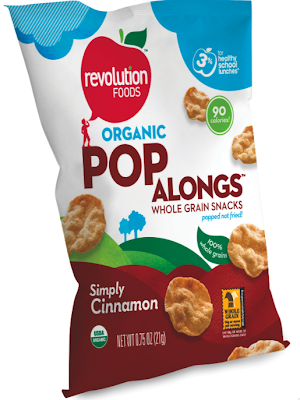 The cinnamon Pop Alongs actually remind me a bit of a Spanish dessert that I loved growing up called Cinnamon Tortilla Crisps (tortillas cooked with butter, cinnamon, and sugar). PopAlongs are whole grain, contain no trans fats, no high fructose corn syrup, and no artificial ingredients. They come in three flavors: Purely Original, Cheesy Cheese, and Simply Cinnamon (the one I love!). The Simply Cinnamon flavor is 100 calories per serving (16 chips), with 3 grams of fat, 1 gram of fiber, and only 3 grams of sugar (the other two flavors have only 1 gram of sugar per serving). So, one serving is only 2 weight watchers points! Because I'm such a huge fan of their products, the kind people at Revolution foods have offered to give away a Lunchbox Sampler to one of the fabulous readers of Yummy Diet Food. The Lunchbox Sampler consists of PopAlongs, Revolution Foods Mashups, and Jammy Sammy Sandwich Bars. To enter, all you have to do is leave a comment on this post by 8:00 PST on Friday March 13th. I'll choose a winner at random. 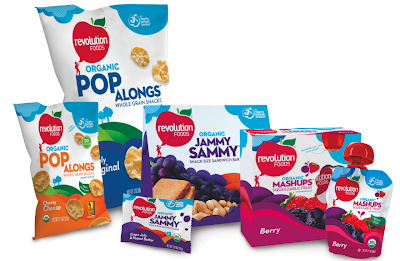 Revolution Foods is also sponsoring their own contest for moms. The cause is very inspiring -- they are looking for submissions from mothers who are revolutionizing how kids eat in their communities. If you are a mom trying to help your kids eat better, it is definitely worth checking out! ooo i would love to try that! i love healthy snacks. I saw these at Whole Foods too! I was about to get them but put them down at the last second! I should have bought them anyway! yet another great recommendation. I would love to try these! What a great new snack to try. I am 6 hours away from a whole foods! I am a poor college student, so these would be lovely! : ) Thanks! Yum! Sounds pretty tasty, I love cinnamon! These sound lovely! I'm really trying to avoid artificial "stuff" at all costs, as my husband and I are trying to start a family! What a neat way to get in a tasty snack! I have really enjoyed your blog since I found it last week. Good things to try! Thanks. These chips sound tasty. I would love to try some. Thank you for the giveaway. They sound great! I can't wait to try them. Those look like a great & healthy on the go snack! =) Yay for new products!! I'd love to try these as well! They look delicious! Those sound really good. I'm going to have to keep an eye out for them and try them out. These look yummy!! I would love to get to try them!! These look really good. Thanks for giving us the scoop! Yum! Would love to try these!!! I tried the MashUps and absolutely loved them. Got some for my grandchildren and they will be part of their Easter treats... I will now have to get these wonderful sounding Cinnamon crunchy snacks and try them. Thank you for the giveaway. To borrow the phrase of a certain celeb ... YUM-O!!!! Please put me in the "running"!!! I've never seen these at Whole Foods, but I'll definitely keep an eye out. I've tried Popchips and didn't mind them. I'd love to see how this brand compares. I've never seen these at Whole Foods, either. These sound fun! I've got to try to find them. Juliet-would love to try these snacks but no Whole Foods near me in rural Ohio, so to win them would be awesome! Thanks for the great tips on your blog - it has helped me lose 25 lbs in 2009! I wish I had a Whole Foods nearby. I love to browse the aisles and look at all the cool products. I would love to try them. I hope I can find some in my area. Oh, pick me, pick me!!! I totally agree that other "popped" chips are bland and boring. I would love to try PopAlongs these to see the difference! I've been seeing Pop Chips popping up on all sorts of blogs lately. They look delish and I'll certainly look out for them next time I'm in WF. Hi -- I love your website...would love to try these. Your website is amazing..i would love to try these to see if they are something i would want to try in the future. Thanks. These sound great! Better than similar items I've tried. Definitely want to try some! Oh yes I've tried these, they're pretty good. The cinnamon flavor reminds me of a popcorn flavor from my favorite place in Branson. Ever hear of The Big Popper? I would love to try those! Would be great t win... I think I'll check out Whole Foods tonight for them! oh my gosh THIS IS so exciting! This is the yummiest looking giveaway by far!!! Please randomly select meee!!!! :) Your blog is awesome by the way. It is so freakin' professional it is totally the next Hungry Girl!!! I am new to your blog and love all the recommendations. I am all about eating natural/organic plus I'm on WW. These popalongs look great! I am always looking for healthy and wholesome snacks to feed myself and my family, these look like a great and convenient option! these look great! i love the packaging too - so cute. i haven't seen these yet (though i do shop whole foods regularly) but will be on the lookout for them! oooh.. sign me up! i actually really LIKE popchips, so we'll see how these compare! Awesome! never tried these before. Thanks for a chance to do so! Definitely the type of snack i can enjoy without feeling guilty! These sound so good...I love trying new healthy snacks but have a hard time as a poor college student with no whole foods around!!! i'd love to try these, i have such a hard time finding snacks that i can afford & are good for me! Snacks! and healthy ones too! can't wait to have a bite! wow these look so intresting! i used to LOVE the taco bell cinnamon sugar twisty things when i was younger.. havent had them in years tho lol! "popalong" is such a cute name! Would love to win this giveaway :) I haven't tried any of those things before, they sound interesting. I love any chance at free and these look like fun! Thanks for the opportunity. Thanks for letting us know about these, I would love to try them! I visited my local Whole Foods for the first time recently, based on your recommendations for Indian food and other things. Keep up the great work! Wow I would love to try these. They look delish. MMMMM! They look delicious. I'd love to try them. looking good!~~~ want to try it out! We don't have a Whole Foods. We just have one grocery monopoly. And they don't have ANYTHING like this! It's amazing how not only gadgets face through evolution but as well as a kid's food! I love chips! I want to win the pop alongs sampler!